Take a deep breath: this will be complicated. 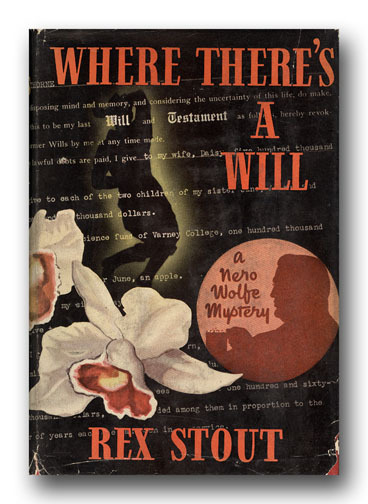 Nero Wolfe has been overspending and a new case drops into his lap that will pay the bills. June, May, and April (oldest to youngest) are three sisters. June is a famous author whose husband is Secretary of State; May, a brilliant chemist, is the president of Varney College; and April is a celebrated star of stage and screen. When their wealthy older brother Noel dies, his will’s provisions for distribution of his multiple millions leave the sisters aghast; he’s left it all to what they are too mealy-mouthed to call his mistress, femme fatale Naomi. The sisters come to Wolfe to broker some kind of agreement — it’s not the money, they all say, it’s the scandal. Meanwhile, Noel’s widow Daisy is a bizarre figure. She had been a great beauty until the late Noel shot off a stray arrow and hit her in the face. She apparently lost an eye and is terribly scarred, but nobody knows for sure because she has worn a veil ever since. Daisy arrives at the brownstone and announces that she doesn’t care about the scandal, she wants to squash Naomi like a bug in public. The family conference deteriorates. Very shortly thereafter, we learn, in what will be a surprise to very few by now, that Noel was actually murdered and everyone is a suspect who was at his country house that weekend; all the people mentioned above plus a couple of State Department guys, a lawyer or two, a swain for the intoxicating April, and June’s two early-20s children. Everyone is gathering (for no better reason than to scrap it out en masse, it seems) and Nero Wolfe actually leaves the house to meet with them all. Many, many plot complications ensue in short order; the experienced reader will not be surprised to learn that if you have a person whose features are always veiled, don’t be terribly surprised if someone impersonates her in the course of a murder mystery. The intense activity culminates in Archie Goodwin’s discovery of the second victim, about 90 seconds before Wolfe hightails it out the door so as not to be detained by the police and miss dinner. Wolfe quickly talks to many of the principals but it’s not till he works his way down to Sara, June’s young daughter, and learns that someone has tried to steal a bunch of old photographs that she took the day of the murder, that he gets a vital piece of information. Coincident with Inspector Cramer showing up at the brownstone with a warrant to arrest him as a material witness, Wolfe delivers the murderer instead and gets to stay home counting his fee. Occasionally I am willing to recommend books just because they are by a certain author, mostly because, well, if you are seriously interested in this Golden Age Detection stuff then you need to have read everything this person wrote — because it’s important. Some of these are, off the top of my head, Agatha Christie, Dorothy L. Sayers, Ellery Queen, and Rex Stout. 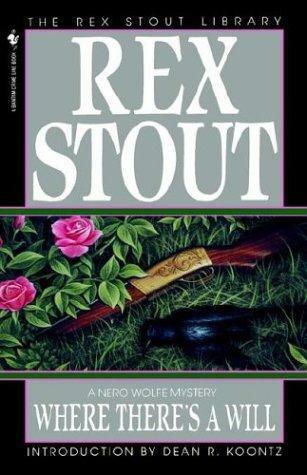 So all the work of Rex Stout gets an automatic recommendation from me. Even if it’s a lousy book, it’s still important to understand where it fits into his entire oeuvre because you have to assume that everyone else who wrote at that time and henceforth will be familiar with it. That being said, there are not many Stout books that are dreary to plough through; even given my relaxed standards and great affection for his work, this is a pretty good book. It’s a lot of fun; there is a cheerful spirit that underlies it throughout and it almost seems as though Stout had a good time writing it. The plot moves at a HELL of a clip, darn close to the pace of a Phoebe Atwood Taylor novel or a Craig Rice story about Jake and Helene Justus. When you look back, the entire novel takes place in a completely compressed time frame that almost seems like 24 hours or so. 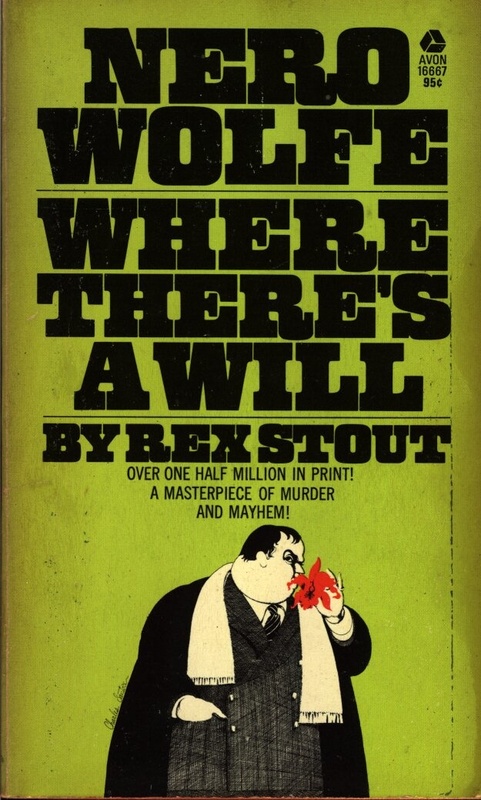 There are lots and lots of vivid subsidiary characters, Nero Wolfe actually leaves the house on work! and, let’s face it, this book has a veiled scarred lady and three extraordinary sisters named June, May, and April. If there is anyone that’s ever put this book down halfway through, I’d like to know why and how. There is also some really good writing in this book. Stout has a little writing trick I’ve noticed. He tends to not describe rooms and locations unless something is actually going to happen that requires you to know what the location looks like. So about halfway through the book when he goes into detail about what is where in something like a rec room in a mansion, with a wet bar, the Stout fan’s ears prick up just a tich. But the precise writing of that section of the book was a pleasure to re-experience. Certainly the lives of the characters and their personalities are larger than life. But there is some nicely observed writing where Archie, who has “a month ago paid a speculator five dollars and fifty cents for a ticket to Scrambled Eggs” and professes himself a big fan of April’s work, nevertheless has a moment where he sees her truly: “she came in and pressed her hands to her temples like the heroine at the end of the second act …”. And of course the brownstone itself is eternal. Barring Johnny Keems, who … well, it’s best to read these books in chronological order, isn’t it? Wolfe is peevish and unpredictable, Archie is faintly lecherous and keenly observant, Saul, Fritz, and Fred are their usual selves, and the red leather chair is in its accustomed place. All’s right with this world. This has in the past been a very difficult book to find in print. 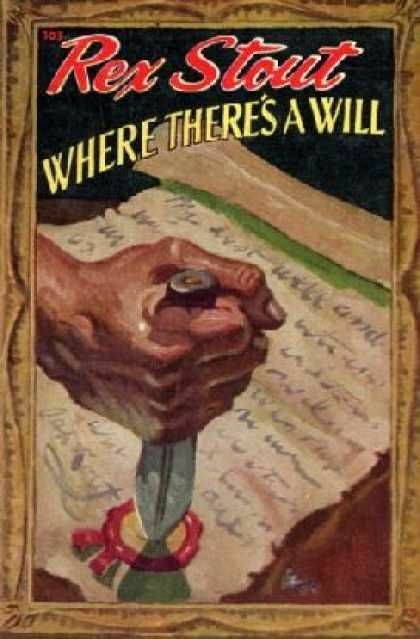 It’s a long story and I’m not sure I understand it all, but when Bantam acquired the Nero Wolfe novels to print as paperbacks, it was forced to leave this one book in the hands of Avon, who reprinted it sporadically and let it lie until Bantam finally acquired it. Added to which, there is a clue in the book of a group of photographs. In the first edition, and in the edition to your left, and not very many other editions, that set of photographs is reproduced in a small and fairly useless form (in the Avon edition it’s tipped in between pages 162 and 163). In most later editions, at least until fairly recently, the photographs were absent. Anyway, my favourite edition is the one you see to the left, Avon 103, part of a brief experiment they did with putting picture frames around their book covers. Because of its scarcity, I used to find all the editions of this book very beautiful, because they meant I would shortly be quite a bit wealthier (depending on edition); mystery bookstores used to have a long waiting list for any reading copy of this book, and the vile green undistinguished edition above could bring me $20. Those days are gone! 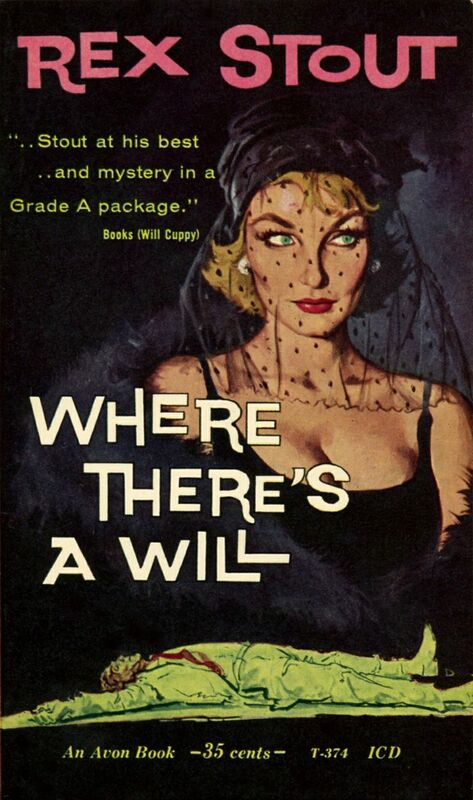 This entry was posted in Brand, Detective fiction, Golden Age of Detective Fiction, Mystery, Mystery writers, Quick Looks and tagged Agatha Christie, Archie Goodwin, Avon, Bantam, Craig Rice, Dorothy L. Sayers, Ellery Queen, Nero Wolfe, Phoebe Atwood Taylor, Rex Stout.